The White House did not provide details of what steps will be taken. In a rare move, the Trump administration confirmed Friday that it will take "immediate steps" to prevent coal and nuclear power facilities in the U.S. from closing. A statement from White House press secretary Sarah Sanders did not say specifically what steps the administration would take but said that "keeping America’s energy grid and infrastructure strong and secure protects our national security, public safety, and economy from intentional attacks and natural disasters." "Unfortunately, impending retirements of fuel-secure power facilities are leading to a rapid depletion of a critical part of our Nation’s energy mix, and impacting the resilience of our power grid," Sanders said in a statement. The draft memo laying out the directive doesn't give a specific amount operators would have to spend but says it will be enough to keep the facilities open for the next two years, saying that U.S. national security "relies on a robust U.S. domestic industrial base, of which the coal, nuclear, and oil and natural gas industries are critical strategic components." 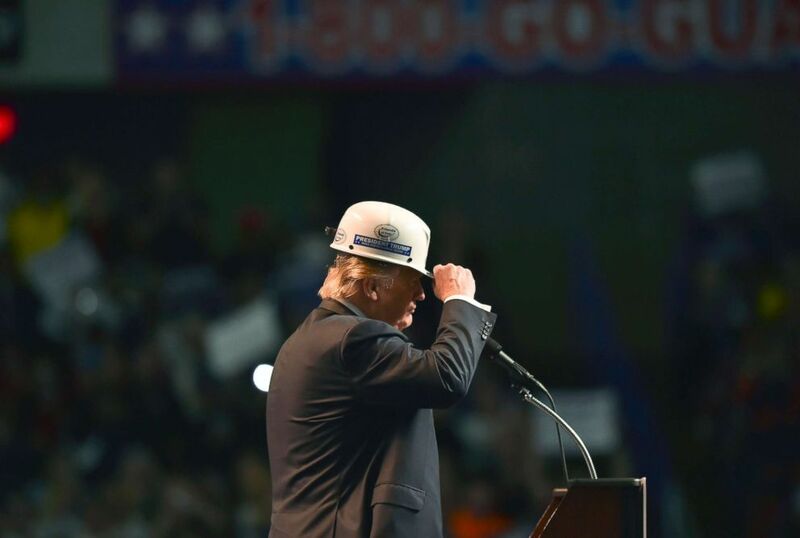 (Ricky Carioti/The Washington Post via Getty Images, file) Republican presidential candidate Donald Trump wears a coal miner's hat while addressing his supporters during a rally at the Charleston Civic Center on May 5, 2016 in Charleston, W.Va. The administration says the move will prevent coal and nuclear power plants critical to the electrical grid from closing, but opponents say the requirement is essentially a bailout for a dying industry that the president promised to save and will cause Americans' electricity bills to get more expensive. The EIA also reports that nearly all power plants that retired between 2008 and 2017 were fossil fuel plants and that most plants that plan to close before 2020 use coal or natural gas. But the agency said that most of the coal powered plants that closed were "relatively old and small." Groups like the American Coalition for Clean Coal Electricity have told the Energy Department that retiring coal facilities could threaten the electrical grid. The National Coal Council said in a statement Friday that existing coal facilities provide "direct economic benefits, energy and price stability, job-creating opportunities and environmental benefits." Perry previously said the department was considering this approach in a hearing with the House Science Committee earlier this month. "It's about the national security of our country. Of keeping our plants, all of them, online, being able to deliver energy, no matter whether it's a natural disaster that we might see from a polar vortex, or it's something more nefarious, as a cyber attack from a terrorist state or some entity with bad intent for the United States," Perry said in the hearing on May 9. But some groups that study the U.S. electric grid say that it isn't at risk of breaking down in the way the directive describes. One independent group that manages the electricity grid that serves more than 65 million people said that it could be bad for consumers if the federal government intervenes in the market. "Any federal intervention in the market to order customers to buy electricity from specific power plants would be damaging to the markets and therefore costly to consumers," that group PJM Interconnection said in a statement. "There is no need for any such drastic action." Another coalition of energy industry groups representing the oil, natural gas, solar, and wind industries issued joint statements saying the administration's plan is "misguided," "unwarranted," and "an exercise in crony capitalism." The American Council on Renewable Energy, a nonprofit that represents various groups that want to emphasize renewable energy sources, said in a statement that the administration is intervening to bail out coal and nuclear power plants "that are no longer competitive on their own." "Arbitrary market interventions of this sort have no place in the electricity structure that has kept American electric power reliable and affordable," the group's President and CEO Gregory Wetstone said in a statement. Environmental groups like the Sierra Club have been pushing campaigns to phase out coal as part of the U.S. energy grid and they say that even a "bailout" will not keep coal and nuclear plants open as the global market focuses more on natural gas and renewable energy sources. “This is an outrageous ploy to force American taxpayers to bail out coal and nuclear executives who have made bad decisions by investing in dirty and dangerous energy resources, and it will be soundly defeated both in the courts and in the court of public opinion. Trump will clearly," Mary Anne Hitt, the director of the Sierra Club's campaign to close coal facilities, said in a statement.